Holiday baking season is upon us. With Thanksgiving next week and Christmas only a month after that it is time to find some new, easy, tasty recipes to bake for all of the parties and family gatherings. I’ve already begun baking by testing some recipes from The Ultimate Cake Mix Cookie Book . If you follow me on Twitter you may recall me uploading photos of my creations a few weeks ago. Before I tell you about what I made, let me tell you a bit about the cookbook first. With The Ultimate Cake Mix Cookie Book, you’ll find that the secret to some of the tastiest, easiest, and most irresistible cookies imaginable begins with a box of cake mix. With just a few extra ingredients and a mixer, anyone can become a baking genius! The Ultimate Cake Mix Cookie Book from Camilla Saulsbury, winner of The Food Network’s Ultimate Recipe Showdown Best Cookie Recipe, is filled with more than 375 recipes that start with a simple box of cake mix and end with a delightful assortment of drop, shaped, bar, filled and traditional cookies. This book can make you the star of your next bake sale, family party, or holiday event. Camilla V. Saulsbury is a food writer, recipe developer, and cooking instructor. She has won numerous national contests, including The Food Network’s Ultimate Recipe Showdown grand prize cookie recipe. Her recipes have appeared in Southern Living, Better Homes & Gardens, Woman’s Day, Cooking Light, and other cooking magazines. She lives in Texas. I chose two easy recipes to try the S’mores Bars and the Peppermint Bark Bars. 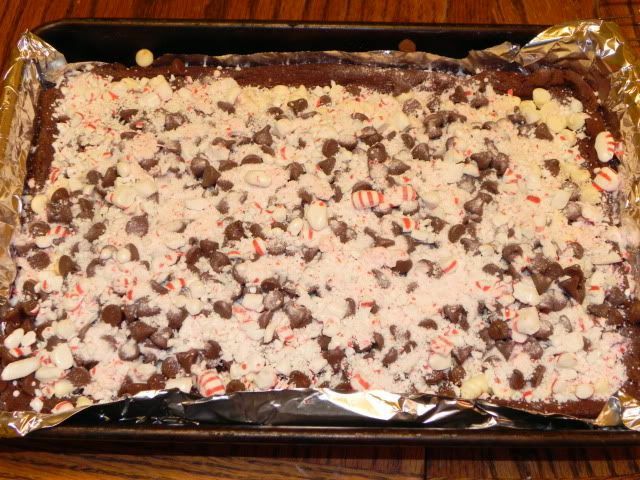 Since the Peppermint Bark Bars are perfect for the Christmas season I’ll share that recipe with you. Mix the cake mix, melted butter,egg, and peppermint extract in a large bowl with electric mixer on medium speed until blended. Pat the dough evenly into the prepared pan. Bake 21-25 minutes until just set at center. Remove from oven and sprinkle withe the semisweet chocolate chips, the white chocolate chips and the crushed peppermint candies. I made the Peppermint Bark Bars and shared a few with my family and then I brought them to church and shared them with the kids in my Wednesday night Girl’s Clubs and they were well received by all. I brought the S’mores Bars to game night at church and everyone loved them but I must say they are best when served warm. I can;t wait to try more recipes from The Ultimate Cake Mix Cookie Book . Just click the link and order your own copy in time for your holiday baking. Disclaimer: I received a copy of the cookbook for the purpose of this review. All opinions are 100% mine. Oh my! They look delicious! I have never made cookies from a cake mix before. I need to check this book out. Lindsay, they are easy and delicious! I used to have patience for baking, but don’t much anymore. This sounds like the perfect book to help me save time with my baking efforts. Baking is my favorite thing to do in the kitchen. get Sammi to help! Jordan did all of the baking for this post so I could take pictures. I”ll quote Lisa above “I want that cookbook!” lol Your recipes looks yummy!! ooh ooh, i might have a cookie party, this would be perfect to use!